Hydrangea Highlights | Faddegon's Nursery, Inc.
Aug 1, 2016 | Shrubs, Trees & Vines, What's New? 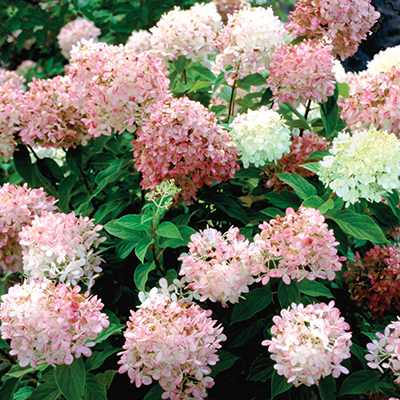 Most gardeners rank hydrangeas among the most popular flowering shrubs. They all have characteristic beauty and stunning blooms in common but each has distinct traits that differentiate it from the other cultivars. For any beginning gardener, the most important thing to know about the different hydrangea varieties is the difference between the macrophylla types and the paniculata types. The bloom shapes are different but there is another important distinction. The bloom color of the macrophylla types can be changed by changing the soil pH. This is done by adding acid (garden sulfur) to the soil which achieves a bluer flower or by adding lime for a pinker flower. When the soil is somewhat in the middle a lavender color is common. Not all macrophyllas change color to the same degree, but a change will occur. Depending on the natural pH of your soil it’s possible you will get the color you want with no adjustment. Also important; the soil pH of the paniculata types won’t affect the bloom color. We’ve selected a few hydrangea cultivars that highlight the differences within this vast group of shrubs. A lacecap hydrangea with a twist! If you love variegated foliage then you’ll want to take a look at ‘Light-O-Day’. The wide white margins on the leaves are very elegant looking and create a wonderful foil to green-leaved types. The centers of the blooms can be pink or blue, while the outer ring of flowers stays white. This hydrangea re-blooms with vigor! This beauty is not just in a name. It really does grow on Nantucket! For years gardeners everywhere wanted what the Cape had; beautiful blue mopheads. Finally, the Nantucket blue hydrangea has been developed for improved hardiness. It was already a prolific bloomer with rich green foliage that kept coming until frost and now we can all enjoy it even in less temperate Northern New York State! ‘Nantucket Blue’ is a fast grower and re-blooms with abandon. And yes, you can make it into a Nantucket pink hydrangea if you want! One of The Endless Summer® Collection. This hydrangea is a cyclone of blossoms! It is super reblooming and very reliable with mophead flowers that begin in June and continue all summer. The flower color is hard to describe it can be pink or purple or blue or a combination. The color is dependent upon the pH of your soil. It’s easy to grow and makes quite a show on its own or in mass plantings. ‘Bloomstruck’ has great disease resistance, especially from powdery mildew. Makes a great specimen plant or grow it in a mass for fantastic all summer color! The first to bloom! ‘Quick Fire’ blooms about a month before other Hydrangea paniculata (hardy hydrangea) varieties. Flowers open white then turn pink, and will be an extremely dark rosy-pink in the fall. They are produced on ‘new wood’ and will bloom after even the harshest winters. This is a large shrub often topping out at 7 feet! Not only are the flowers show-stoppers but the size of the plant makes it even more so. For a magnificent display well into Fall, you won’t regret planting ‘Quick Fire’. This is one outstanding hydrangea! The pistachio colored blooms will make your summer feel light and fresh. As Fall approaches, the huge cone-shaped flowers take on shades of pink until a very deep tone is reached. The size of a mature ‘Limelight’ means this hydrangea offers true impact and several together can make a gorgeous easy to maintain hedge. Fire Light® is the standard to measure all hardy hydrangeas! This easy-to-grow, reliable panicle hydrangea was developed in Michigan, and selected for its huge, full flower heads and sturdy, strong stems. Blooms emerge creamy-white and age to a vivid red for lots of summer color. It makes a great cut flower, fresh or dried, and can be used as a hedge, specimen, or incorporated into flower gardens and foundation plantings. Annabelle is probably the most reliable bloomer of all the Hydrangeas. It is a native hydrangea (‘Annabelle’ was discovered in one lucky gardener in Anna, Illinois) and time tested. ‘Annabelle’ is happy almost anywhere. She is one of the few hydrangeas that will take shade. The profuse, mammoth blooms and clear white flowers are so perfect they are often used for bridal bouquets. If you choose ‘Annabelle’, make sure to cut a few and enjoy them indoors and out. You’ll have plenty of opportunities since she blooms from June to September! Have a small space and love hydrangeas? This hydrangea is for you. ‘Bobo’ is polite and doesn’t take more than its share of space. It stays compact and doesn’t flop! The blooms are so pretty as they age to a lovely soft pink shade which is great for drying. The first flush is so prolific you may not see the leaves and they’ll re-bloom from midsummer to early fall. Once established, this hydrangea is also drought tolerant. The Endless Summer® Collection consists of four beautiful re-blooming hydrangeas. The Original, the first of the hydrangea varieties in the collection, revolutionized the way gardeners were able to incorporate hydrangeas in their landscapes. It is still the hallmark of the shrub collection and with good reason. It was the first hydrangea discovered that blooms on the previous year’s woody stems and the new season’s growth. The Original is a hardy, disease-resistant and time-tested sensation. It also has the ability to bloom as an eye-catching blue hydrangea OR pink hydrangea by adjusting your soil’s pH level as needed. This versatility and demonstrated quality makes The Original a must for your garden landscape!